Peer to peer lending platforms make the triple motives of lending money, receiving regular interest and full repayment of principal hassle-free and convenient. Yet, human beings are ruled by twin emotions of greed and fear. We also suffer from some cognitive biases that can blur our thinking and impact decision making. In short, there are mistakes that P2P investors can commit. 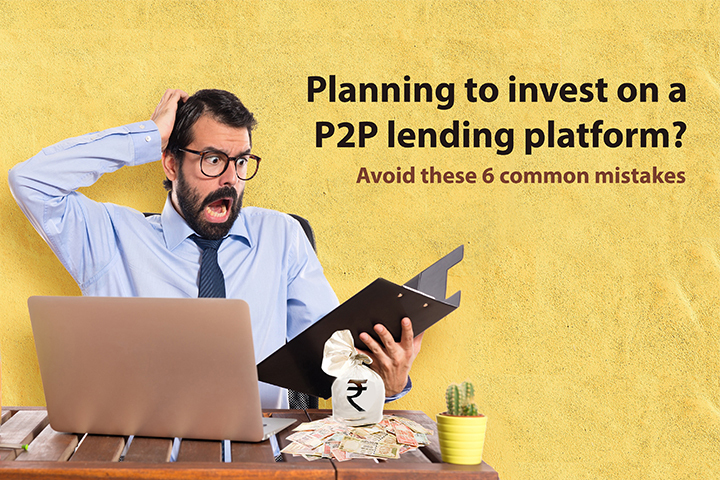 With a proliferation of lending platforms, prospective and existing peer to peer lending investors should avoid common mistakes. Here is a list that should help you get started and side step the usual follies. Read on. Peer to peer lending like any form of investing is about striking a balance between risk and reward. We all know that high risk increases chances of high rewards. But, don’t chase high returns in P2P lending. Some platforms may claim that lenders are making 30-40% returns annually. If you are starting out as a P2P lender, target a modest and reasonable rate of return like 12-15%. Remember even at 15% rate of return, you will beat inflation, take returns after tax and generally beat most traditional asset classes. We at Monexo maintain that a P2P investor can get 15% annual returns. Additional reading: How Can I Grow My Money With P2P Lending? Peer to peer lending is not rocket science. If you just spend some time reading about it, you will gain good knowledge. At the end of the day, it is lending money with a hope of making good return on repayment by the borrower. Many P2P lenders in their hurry do not properly read all the terms and conditions. They do not understand basics of this new-age investing. Merely having money is not enough. Just like buying a car or a house, spend some time reading about peer to peer lending. For instance, you can brush up your knowledge on P2P lending by reading insights on our blog here. If you still have questions, head over to frequently asked questions section to find out the nitty gritty of how peer to peer lending works. Read and empower yourself so that you can take an informed decision. The lure of being short-term when it comes to investing is understandable, but it should not be encouraged. You can justify your short-term approach by talking about sales targets at office are weekly, how people quit jobs in months or how quarterly results are available for even big companies every 3 months. Short-term strategy is peer to peer lending will expose you to high amounts of risks. You should not expose yourself to such risks because this will in turn increase volatility of earnings. You as a lender investor should adopt long-term approach in P2P so that returns become smooth and give you a hassle-free experience. Letting go of a few percentage points of short-term returns are much better. For example, investing/lending in only the highest risk-rated loans can potentially give you highest returns because of the highest risk assumed. Instead, it is better to fund all types of loans (lowest risk to highest risk). Such a strategy delivers better risk-adjusted returns for long-term players. Many P2P investors feel if there is one borrower who is ready to pay 25% interest rate, why should they look at others? The reason is diversification. Never put all your eggs in one basket, says the old investing adage. Peer to peer lending is best enjoyed when you diversify your investments. Lend small amounts of loan money to different loans/borrowers. A P2P platform like Monexo helps you manage the administrative hassle of managing these small loan amounts and also enjoy diversification. When you lend to one person, your risk of default is 100%. But when you distribute the same over 100 loans, the risk reduces to 1% each at the portfolio level. On Monexo marketplace you can lend as little as Rs 1,000 per loan. So, with Rs 1,00,000 you can have 100 different borrowers in your portfolio with different risk profiles and tenor of repayment. We also have Monexo ratings (M1 to M8, with M1 being the best) to help you truly diversify. If you can insure your home, car, equipment, health and life, why not your loans? Many peer to peer lenders do not know that with credit shield they can ring-fence P2P investments. As a result, they go to platforms which offer no extra layer of protection. Credit shield is a specialized group insurance policy which helps protect lenders from some specific event based risks that might affect a borrower's ability to make loan repayments. Imagine a borrower's financial position gets really bad and they cant repay. This is when the credit shield is activated. The proceeds from insurance claims will be assigned to the lenders to offset the outstanding principal or EMI (as per the terms and conditions of the insurance cover). Credit shield has been structured by Monexo in partnership with one of India's leading private insurance companies. It is available at no extra cost to the lender! Risks of financial loss for the lender due to non-payment of dues from borrowers inflicted by accidental death, permanent disability and job loss is mitigated. The best investing techniques always account for the worst of the scenarios. People account for non-repayment, investments running into problems etc. Since P2P platforms allow you a nice way to invest, that does not mean these platforms are immune from all risks. What of the worst happens and the platform itself is shut down? What happens to your hard-earned money then? As an astute investor, you need to think of this scenario too. This is when P2P platforms that offer extra protection make you realize their true worth. For instance, Monexo has appointed an independent administrator, IDBI Trusteeship Services Limited (ITSL) to manage the escrow account. In the event of Monexo's assets being harmed or Monexo going into liquidation (it is a theoretical possibility), this will NOT affect your money. Yes, your money still belongs to you. For money that has been lent, ITSL will continue to get repayments from borrowers and distribute the collected payments to the P2P lenders like you. Conclusion - Mistakes cost time and money. As an investor in peer to peer lending, your goal should be to minimize mistakes and maximize risk-adjusted returns. The more number of mistakes you avoid during your P2P investment journey, the better will be your experience. Some mistakes can permanently affect your capacity to invest. We hope that you will learn from the mistakes highlighted above and do everything in your power to avoid them. Selecting the right platform is often as important as selecting the right borrower. Invest with Monexo P2P lending. Apply to be a P2P investor today.